LG's first Windows Mobile powered smartphone has officially been confirmed to make its arrival with the carrier for those customers yearning for a tasting of Windows Mobile goodness from LG's camp. After we've reported a few days ago on the LG Fathom's expected itinerary, Verizon has officially confirmed its availability to its business sales channels starting on May 27 for the price of $149.99 with a contract. If you're not a business customer, then you'll only have to wait just a little bit until June 3rd when it's expected for it to go live for the rest of its sales channels which includes retail stores and indirect partners. However, it's $149.99 on-contract price after a $100 mail-in-rebate may allow customers to potentially look at Best Buy's offering which is speculated to cost only $99.99. Still, the handset should still give owners a great experience for the money seeing that it sports a 3.2” WVGA touchscreen, sliding QWERTY keyboard, Wi-Fi, GPS, Bluetooth, 3.2-megapixel auto-focus camera, and the ever snappy 1GHz Snapdragon processor. Even earlier...the Incitehttp://www.phonearena.com/htmls/LG-INCITE-phone-p_3266.html Of course, I never had good luck with LG, so I'll pass. First LG Win-Mo phone with Verizon?? Maybe? Yeah I believe they mean the first one on Verizon. You can kinda tell if you fully read the first sentence. Unlike alot of people.. 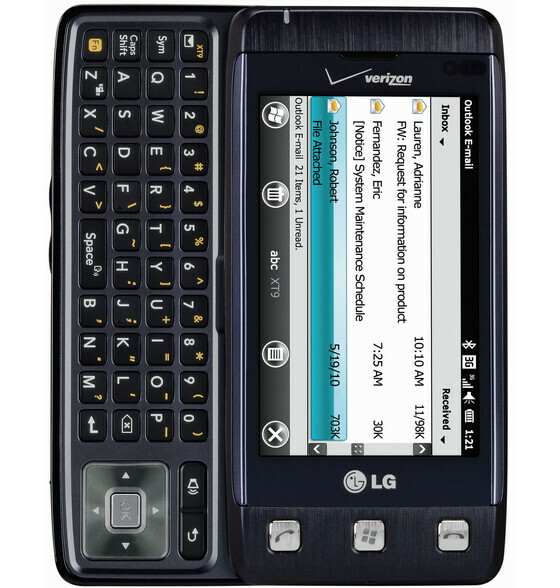 I've never had any problems with my Env Touch. I love it. Although i did opt for the extended battery. This phone is going to fall flatter than a dead fish. I was thinking initially of looking at either this phone or a Touch Pro 2 as a replacement for my current phone. Not really sure after seeing the keyboard layout or the look of the phone compared to the Touch Pro 2. I guess I will wait till they actually release it so I can see one in person. I like the 1Ghz processor, but not sure if that's enough. Remember the LG ARENA, AT&T already stopped furthers orders on that phone. I thought LG only sucked with AT&T, but from what I am reading and hearing, Verizon is having lots of issues, too. Samsung is doing well with AT&T, though. Perhaps, LG should just stick with wash and dryer machines. If the screen were capacitive or Infrared, it could be upgradeable to WP7. That would have made this phone worth buying, b/c it has the 3 button requreiment, and all the other stuff seems to fit, but there could be some other updates left out.